In 8 years of living in Colorado, I hiked many trails, but never Hanging Lake. 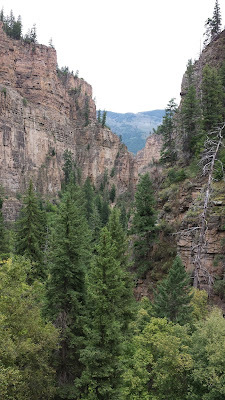 Maybe it was out of sight, out of mind since the trail head is in Glenwood Canyon, about 10 miles before you reach Glenwood Springs. My last stop on I-70 many times was Beaver Creek. This trail is another 50 miles past that. Now that my sister and I have made the Jazz Aspen Snowmass Experience a Labor Day tradition three years running, we pass the trail head along the interstate. On the weekends, the parking lot fills quickly and the electronic signs on the highway will let you know before you attempt to exit. We opted for Friday afternoon hiking before all the holiday weekend hikers arrived. Hanging Lake is not a long hike, roughly 1.2 miles from the trail head. And the trail head is about a quarter mile of sidewalk from the parking lot. I'm going to put it out there: short hike does not always equal easy hike. We were warned. More than one sign between the parking lot and the start of the trail reminded us that the trail would be difficult. It's steep. There is an 1,000 foot elevation gain. But the hike is not a race. It's well-marked. Enjoy the journey. 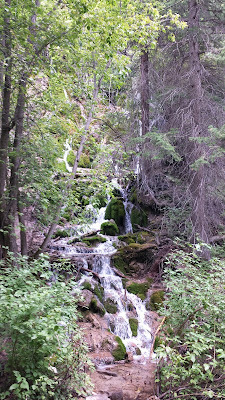 Over Labor Day weekend, the waterfalls along the way were beautiful and lush. 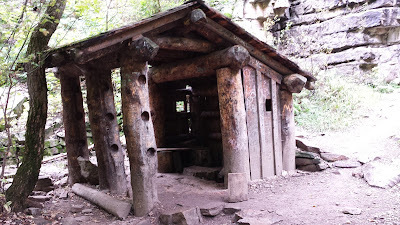 If you've hiked this trail, these sights will be familiar. If you haven't hiked it yet, enjoy! After those last steep steps, we arrived! 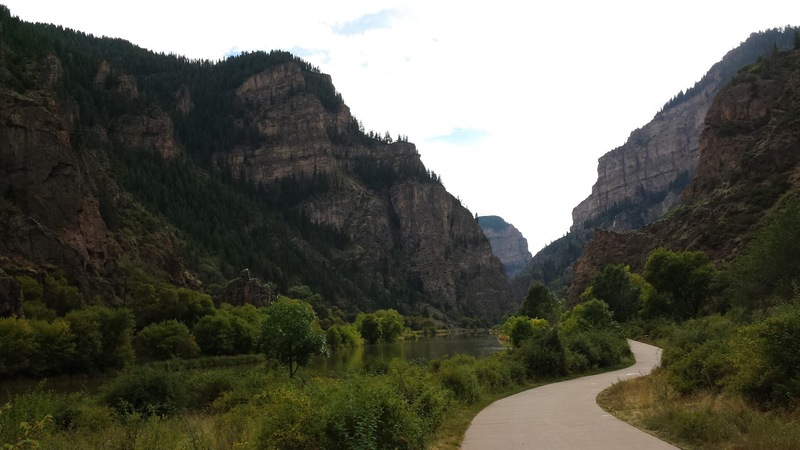 Summer 2015 - there was construction in Glenwood Canyon, so the Grizzly exit wasn't open. We went into Glenwood Springs and checked with the visitors center and they gave us the update. The sign isn't kidding, sturdy shoes are a must. The trail is rocky in parts and other parts are dirt-packed, which can get slippery if it rains. 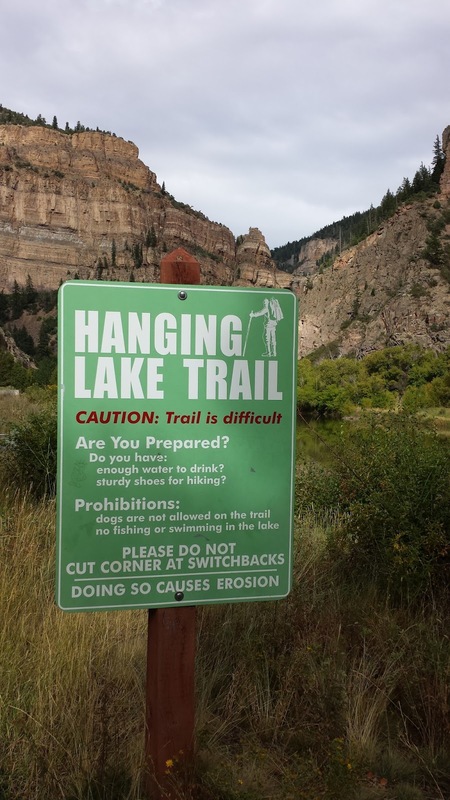 Have you hiked Hanging Lake? What's your favorite Colorado hike? The Hanging Lake trail certainly seems worth exploring. I will have to have a look into it sometime. Thanks for the tip.